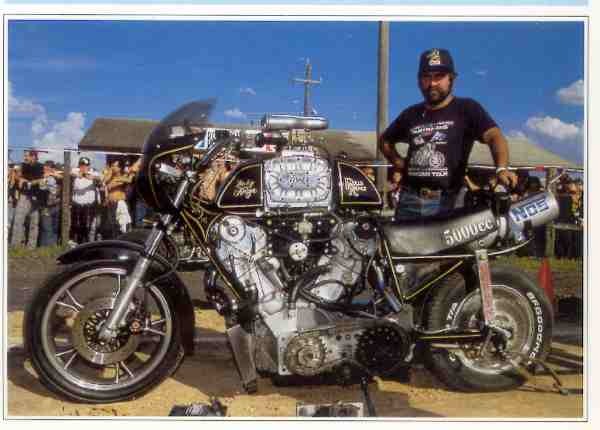 "Even in the United States, home of the fire breathing monster dragsters, where big is the status quo, this amazing Australian built bike caused a sensation. The formula was simple, just take the 27 litre V12 Rolls-Royce Merlin Engine from a World War II fighter plane, cut off the first row of cylinders, and spend the next few thousand hours putting this hulking v-twin on two wheels! The Merlin is ‘The World’s Biggest Motorbike’ but getting your name in the Guinness Book of World Records is becoming increasingly difficult. Lucky Keizer, the Australian creator of this wild ride, qualifies as the builder of the motorcycle with the world’s largest engine. This is a road monster; nothing like it has been seen since the early days of motorcycling. The last time is when the French Buchet company in 1902 built a monstrous vertical twin engines and mounted the 4245cc engine in a tricycle and a 2280cc engine on two wheels, or when young James Scripps-Booth, son of the owner of The Detroit News, built his astounding 6307cc V8 "Bi-Autogo” in 1912. The 3200 lb moto-titan still survives in the city where it was built. It was a totally impractical dead-end two-wheeler design that needed retractable outrigger wheels to stay upright at speeds under 20 mph. Still it was America’s first V8. The monstrous Merlin would win no beauty contests, but for sheer muscle there’s nothing else quite like it!